Welcome to Big Bear Lodge in the Smoky Mountains! 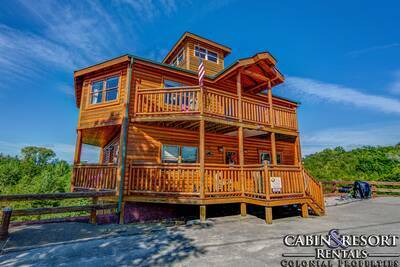 This breathtaking 3 bedroom, 3 bath cabin rental is an amazing place to experience the beauty of the Smokies up in the mountains away from it all! Step into the gorgeous living room of this vacation getaway and surround yourself with upscale décor, a mountain stone accented gas fireplace, leather furniture, a sleeper sofa, cathedral ceiling, flat screen TV and access to the main level covered deck. Nearby is the gourmet kitchen featuring stainless appliances and granite countertops. The breathtaking dining area seats up to 6 comfortably and is surrounded by beautiful mountain views from expansive windows. Just off the dining area is a side porch with porch swing and sitting area. On the main level of Big Bear Lodge is a spacious king suite bedroom with a flat screen TV and a nearby full bath with a relaxing jetted tub. Also on the main level is the deck with mountain views, the gas grill, a glass patio table and table with chairs for plenty of space for outdoor entertaining. Venture down to the lower level of this cabin rental and you’ll enter the second living area, sleeper sofa, leather furniture and game room. Here you’ll find a flat screen TV, wet bar, pool table, access to the deck where there’s a cozy porch swing and bubbling outdoor hot tub. Just off the pool table area is a screened in porch with a table and chairs, perfect for summer evenings. On this lower level there is a second king suite bedroom and full bath for added privacy and convenience. 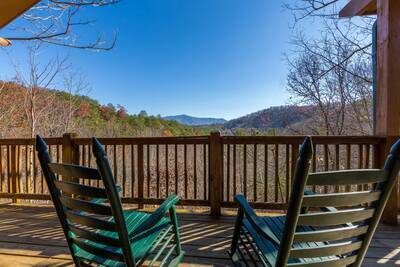 You'll love the porch off of this bedroom with gorgeous mountain views to wake up to. Just off of the hallway from this bedroom is the laundry closet with side-by-side washer and dryer. On the upper level of Big Bear Lodge you’ll find a comfortable sitting area with unique windows letting in the stunning mountain views. You'll find the twin sleeper sofa here as well. Also on this upper level you'll find the last king suite bedroom with a full bath, jetted tub and private balcony for enjoying the sweeping views of the mountains. You'll love the gorgeous windows in this bedroom and glider rocking chair. Big Bear Lodge provides you and your guests with complimentary wifi internet access so that you can browse the internet or check your email while you’re on vacation. 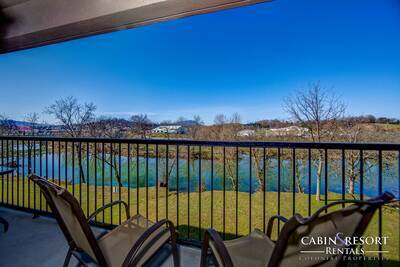 With its breathtaking Smoky Mountain views, exceptional living space, upgraded amenities and luxurious appointments, you’re definitely going to have a great time while vacationing here! Reserve your stay today! A: There is a property location map located at the bottom of the page. A: Hi LeighAnn! Big Bear Lodge is located in beautiful Wears Valley. A: Hi Christine! They are more winding than steep. Yes, your Suburban will be just fine. “ Our cabin was by far the best cabin I’ve ever stayed in. Everything from the amazing view to the fact that every room was spotless and very clean when we arrived. The place was beautiful. My entire family walked away saying it was their best vacation ever and it all started with The Bear. Memories were made that will last forever. Thank you so much. We plan on visiting this exact cabin every year. 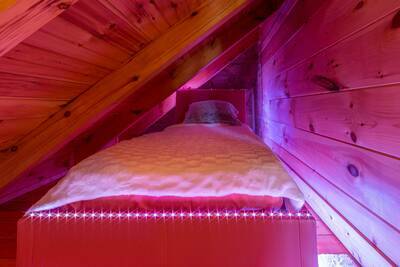 “ We enjoyed every moment of this spacious cabin. The views are so astounding that i felt lkie we were living a dream the whole time. I am so glad we came andd i hope we will be able to return soon. “ Had a great time! “ We absolutely loved the cabin! Plenty of room for our families and the view and feeling of seclusion was exactly what we were looking for!!! “ We stayed at Big Bear Lodge in May, 2018 and absolutely loved it! Not only the beautiful cabin but the views were amazing. We sat on the many decks and watched birds , squirrels and even a bear! We loved our family time there so much we went back to the same cabin three months later. Working with the rental property could not be easier. Highly recommended! “ Great cabin with an amazing view. 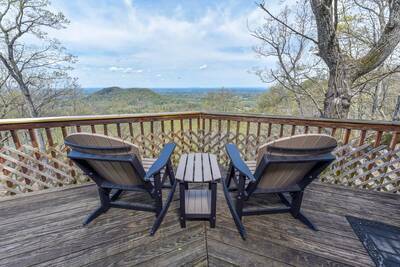 A few tight and steep curves to navigate coming up the mountain but the cabin floor plan and view are well worth it. We will certainly stay here again. Make sure the lid locks tight on your trashcans at night. We had a friendly visit from one of the "furry locals" looking for a midnight snack. Cabin was clean and ready when we arrived. They called to check on us on our way to the cabin and called again after check out on our way home. “ What a great lodge to spend with our family this fall! Absolutely perfect for 3 couples. Everyone had their own space with plenty of room for everyone to gather. We’ll stay again at the Big Bear Lodge! “ Big Bear lodge is an awesome cabin. The views are spectacular. Colonial Properties was a great company to deal with. Everyone was very helpful in making our first trip to TN enjoyable. “ This view is so worth it!! Love this and I wish we didn't have to leave!! 4 Days is not long enough trust me.